A left handed all purpose scuffle hoe weeder. As far as I know, we are the only ones making a left handed version. 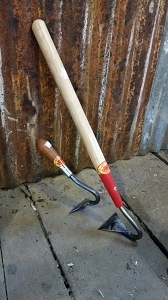 A left-handed version of the Cape Code Weeder for our Southpaw customers.